Nice to see the thrust master series included in your list. So these are all compatible with Xbox 1S and X also, correct? I have updated the article – please take a look. I don’t see specific mentions to compatibility with Xbox One X. Do we assume if you mention compatible with Xbox One, that means okay with “X”? Many on Amazon make comments that a few of these are compatible but since you are reviewing I wanted to check what you’ve tested/recommended. Salut Eugen, bun si corect articolul doar ca in sectiunea de “best sellers” s-a c-am strecurat o greseala. 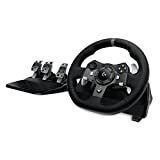 Logitech G920 nu e deloc de la …$58.89 pe Amazon, sau poate ala e pretul pentru cutia goala. Apropo, foarte buna si exprimarea in engleza. Daca esti interesat, n-ar strica sa te uiti de un job in State, mai ales in Bay Area. Succes!!! 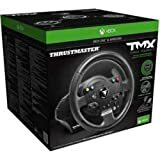 does a racing wheel truly give the experience of riding an actual car and racing it through the tracks? So these are all compatible with Xbox 1S and X? These prices are insane man. Some of these cost more than my PC. I’ve just started looking into driving wheels. Are there any that don’t require mounting?